Cardiff Contemporary, the Welsh capital’s biennial festival of international contemporary arts, is announced to take place between Thursday 20 October – Saturday 19 November 2016. The 2016 theme of communication, and title, Are You Ready? references Marconi’s breakthrough radio signal, made from Flat Holm Island to Lavernock Point in 1897. 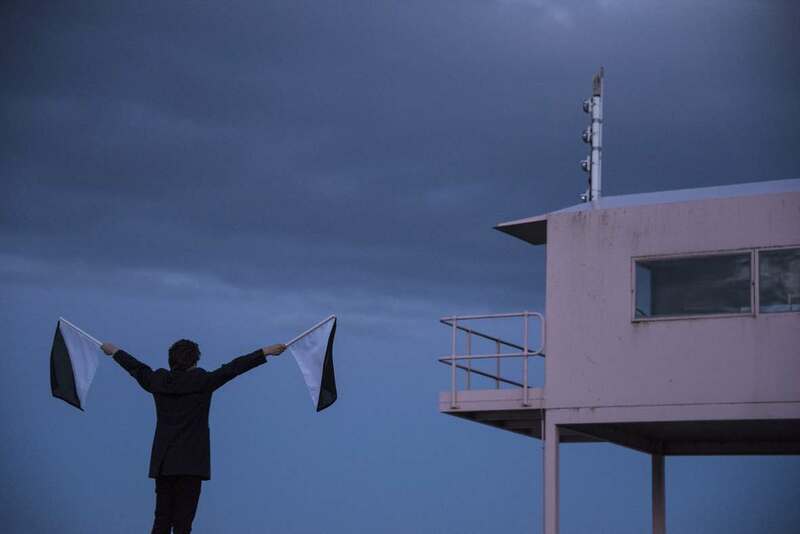 Ten new artist’s commissions include the activation of a permanent sculpture on Cardiff’s waterfront and the re-appropriation of two derelict city landmarks, where artists will communicate ideas globally and through space and time. Thirty one days of artistic challenge and discovery opens across the Welsh capital on Thursday 20 October 2016 as Cardiff Contemporary gets underway for its fourth edition. Drawing together international and Wales-based artists to charge the city streets, galleries, forgotten spaces and communities with the crackle of new and exciting ideas in multi-disciplinary visual, sonic and performance arts. The theme of ‘communication’ looms large, as artists and audiences are urged to look beyond earth, through time and to each other for clues, answers and inspiration. Taking in historic sites from the city centre to Cardiff Bay, Cardiff Contemporary will find its focus in a temporary hub, ‘The Angel’ developed to include five new gallery spaces across a derelict floor beneath the city’s Angel Hotel. From here brand new commissions will radiate across Cardiff, including impressive new public sculpture along one of Cardiff’s most public landmarks, a takeover of the imposing-yet-defunct Old Post Office at Cardiff Bay for an exhilarating, public reclamation and an un-missable light sculpture to welcome travellers arriving at Cardiff Central Station. Artists and groups confirmed include: Megan Broadmeadow, Laura Ford, Roman Štětina, Robert Montgomery, Heather and Ivan Morison, Anthony Shapland, Rob Smith and Charles Danby, tactileBOSCH, Spit & Sawdust with Edwin Burdis and a collaboration between Richard James, Angharad Van Rjiswijk, comedian and writer, Stewart Lee and Andy Fung. The themes and overarching title for the festival, ‘Are You Ready?’ is a direct reference to the residency of Guglielmo Marconi in the city. As an exile from Italy where his pioneering vision was met with scepticism, he was supported by the British Post Office to develop his experiments into radio communications technology. Assisted by local engineer, George Kemp, Marconi succeeded in transmitting those three, immortal words in Morse code from Flat Holm Island in the Bristol Channel to Lavernock Point, Glamorgan on 13 May 1897. Just four years later, the pair succeeded in the first transatlantic radio transmission. Artists have been asked to consider this history and the modern age of instant and relentless communication in developing new work. Creating a period of city-wide, creative celebration, Cardiff Contemporary coincides with Artes Mundi 7 art prize and exhibition (opening Friday 21 October at National Museum Cardiff) and the city-wide Sŵn Music Festival (Friday 21 – Sunday 23 October, various venues). Reportedly discovered in 1901, the same year as Marconi’s transatlantic radio transmission, the Antikythera Mechanism is an ancient, bronze instrument of multiple, moving parts described as the earliest analogue computer. Bristol-based artist, Megan Broadmeadow will use this seismic archaeological discovery as the basis for a new sculptural work, simultaneously reflecting on the mechanism’s resting place at the bottom of the Mediterranean and the ancient Egyptian and Greek civilisations that it is related to. Laura Ford’s sculptures, combining tenderness, fantasy with frequent signs of menace to relay political or social comment, will bring something suddenly and mysteriously new to a Cardiff city centre landmark. This project will remain purposely under wraps, exercising the art of surprise. Fully engaging and rising to the challenge of the festival theme, Czech artist Roman Štětina collaborates with curator Louise Hobson to develop a ‘call and response’ collection of works along a city centre street, requiring the fleeting presence of the public passing through the city to become active. The final piece will reference not only Marconi’s initial achievement, but the enduring success of radio as the place that generations of people, right up to and, likely far beyond the modern day, consistently turn to for evidence of a reassuring human presence in times of crisis. Beautifully capturing the convergence of prose and visual art, Robert Montgomery’s work in neon, fire, billboards, painting and print has written deeply-affecting statements large across public spaces from Trafalgar Square, London to Tempelhof Field, Berlin. Facing the entrance to Cardiff Central Station, Montgomery will make his latest statement in Central Square, illuminating every traveller’s arrival and departure with an intervention that invites a moment of reflection in the most transient, time-bound corner of the city. Combining to deliver work that transcends the divisions between art, architecture and theatre, the duo of Heather and Ivan Morison will activate Cardiff’s waterfront with their first, permanent public building. Located at Cardiff Bay, the meticulously sculpted structure, inspired by stave churches of Norway – a country inextricably linked by historic trade to Cardiff – and ad hoc beach shacks of 1960s West Coast America will appear as a functional food and drink outlet. Love Me or Leave Me Alone will play host to a programme of special events curated by Chapter on Saturday evenings during the festival. Signwriting is an art form that is dying out and one of the most common forms of communication spanning the birth of trade and commercialism as we know it. Cardiff-based artist, Anthony Shapland is exploring the art and one of the city’s oldest surviving practitioners of the trade, whose own, physical canon of works has been gradually eroded by the advancement of regeneration, knocking down the workshops and traditional retailers that once proudly bore the fruits of his labour. A project that arrives in Cardiff courtesy of PEAK – Contemporary Art in the Black Mountains – and the Canal & River Trust, Charles Danby and Rob Smith return to the rural heartlands above the city, encountering the canals, quarries, tramways, caves and kilns that fed the heavy industries that roared in South Wales. For Limelight, the artists will use digital means to bring reflections on this history to contemporary audiences by streaming a series of live illuminations to a city centre location and online. The material for their work will be limelight itself, an intense white light generated through heating quicklime used in the 19th century for land survey work and stage lighting. Each broadcast will last as long as it takes for the chemical reaction to be exhausted. Borrowing directly from a masterpiece by the artist collective’s namesake, Hieronymus Bosch, the Garden of Earthly Delights promises a vibrant, prodigious and inclusive multi-media exhibition in the old Docks Post Office, a vast disused building in the historic area of Cardiff Bay. Their invigoration of a long-abandoned landmark will be a ‘gesamtkunstwerk’, gathering collaborators together to include site-specific installation, video, painting, photography, sonic art, interdisciplinary collaborations and spontaneous interventions, starting with a wild launch night of live music, cabaret, spoken word and visceral performance art. An audio-visual, immersive installation based on the psychogeography of childhood and the wider themes explored in Arthur Machen’s book, The Hill of Dreams, Richard and Angharad will travel to locations of their childhood in Carmarthenshire, Pembrokeshire and the southern Netherlands to record the landscapes that defined their childhoods. The pair’s collaborative suite of footage, field recordings and archive material will be embellished by comedian and writer, Stewart Lee, recording an original, narrative piece for the audio installation and artist, Andy Fung who will paint an accompanying canvas that reflects on his Trinidadian upbringing. Occasionally a misunderstood and maligned fixture in city spaces, skateboarders and skate culture are set on a collaborative collision course with artists in a project that draws parallels between the two protagonists. As both visibly inhabit and frequently alter the city spaces that they use, the artist-led collaboration will look to the ‘internal’ language of skating, experimentation in using public space, the conventions by which skateboarders communicate and celebrate new skills and ideas and popular forms of documenting performances, primarily video, as part of this new work. The outcome is intended to be a timely discussion about how we exist in close proximity with others who may have different ideas or agendas. Cardiff Contemporary is funded by the City of Cardiff Council and the Arts Council of Wales.